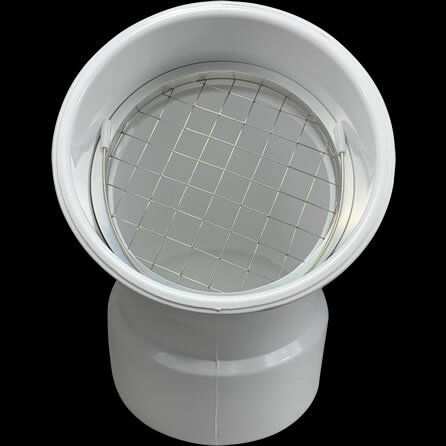 The PVS-RS4 is a 4″ PVC vent screen designed for use during any season, including winter. The PVS-RS4 maintains maximum airflow, making it an ideal screen for use on active condensing vents that are common with modern day high efficiency furnaces. 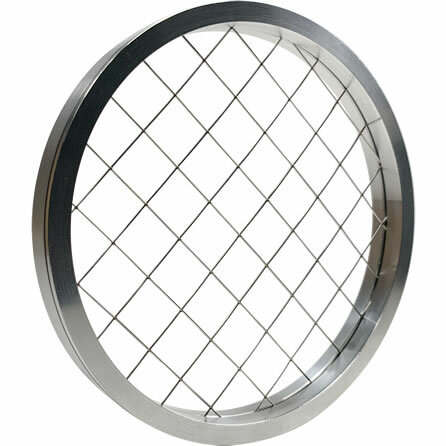 Because the screen is made of stainless steel, which is encased in an aluminum shell, this vent screen resists corrosion and is well suited for use on both intake and exhaust vents. If the purpose of a PVC vent is to allow air to pass through, why restrict that airflow with an inferior product? We asked this same question and designed the best 4″ rodent vent screen available. The PVS-RS4 is made with a tough 316 stainless steel welded wire screen that has openings that are just under one half of an inch, which maintains 90% airflow. The screen is housed in a 6061-T6 aluminum shell that will not scrape, gouge or damage PVC vent pipes. The PVS-RS4 is designed to fit into any standard four inch PVC hub or coupling and is secured in place with one included 304 stainless steel internal wire clip. Both the screen and internal wire clip resist corrosion, and the internal wire clip can be reused when changing over to our 4″ PVC insect and rodent screen for maximum seasonal protection during the warmer months. The PVS-RS4 is ideal for use during the winter and safeguards high efficiency boiler, furnace and hot water heater vents from animals. With openings that are just under a half inch, birds, mice, chipmunks, squirrels and other animals will be denied entry into intake and exhaust pipes. Since the PVS-RS4 maintains an industry leading airflow rate, it is the ideal screen for use on active condensing vents. Our PVS-RS4 has an outside diameter of 4.470″ and is designed to fit inside any standard 4″ PVC hub or coupling with an opening of 4-1/2″. Those who get a 4″ measurement on the outside pipe diameter often are likely measuring the outside of a 3″ hub (normally the size is embossed on the hub for confirmation), which has an inside diameter of 3.500″. In such cases our PVS-RS3 is the correct vent screen to purchase. Proper measurement techniques and dimensional product cross references are discussed in more detail on our sizing vent screens page.